I am the main cook in the house – I enjoy cooking but there is a member of the family who loves to cook more than me. She is just passionate about it. Excited to be trying new recipes. Excited to be learning new ways of preserving, baking, or simply planning meals the family can share on days she’s home. The joy of cooking, she says, is the miracle of the transformation– the change from the single, raw ingredients into tantalising, appealing and delicious things to eat. Most years the figs ripen and we have the fun of discovering them in passing – picking one or two and enjoying their juicy, sweet and meaty texture. But one or two are enough, leaving the rest to the birds. Not this year. 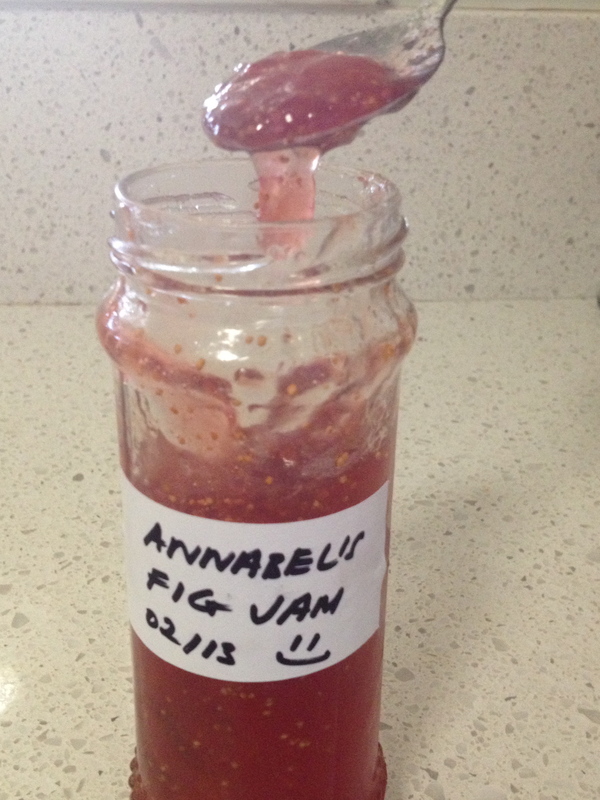 For she who loves to cook had other plans…figs for jam! Learning to make jam is not easy. After first experimenting with batches of marmalade, there was the frustration of it being just a little bit runny. The next marmalade experiment was with pectin and it came with the disappointment of the marmalade being a little too hard. It often can be this way when learning to do new things- arising frustrations and disappointments – the strong emotions that come when our expectation are different to our experience. Some people’s first experiences of mindful meditation can be similar. The distraction of a busy mind wandering off again and again as we try to watch our breath, leaving us frustrated instead of relaxed. So when we expect meditation to transform our stress – we find it initially can enhance it! Yet it is said that practice makes perfect. And so it is with jam as much as it is with meditation. This is because the purposes of the meditation is to be mindful and observe the frustrations as they come and go – not react too them – for its in those moments of observation that we gain insight into our old habitual patterns of reaction and have the choice to change our responses – and that’s what transforms us. And so it was with the jam -the adventure of going to the bottom of the garden. The fun of picking and bringing a bounty of figs home. Figs, washed, chopped, cooked and ‘jammed’ into the pristine clean, sterile jars that had been collected and waiting for this special moment. The mixture that emerged from the saucepan transformed the raw notes of the wild figs into something wonderful. A delicate pink, sweet caramelized fig jam now graces our morning toast allowing the summer flavours to linger well beyond the season. And even more, provide a sweet reminder and happy memories that were ‘cooked up’ that day that warm our hearts. So for us this year we were blessed by the practice, practice and more practice of one dedicated young jam maker and by a bountiful fig crop. 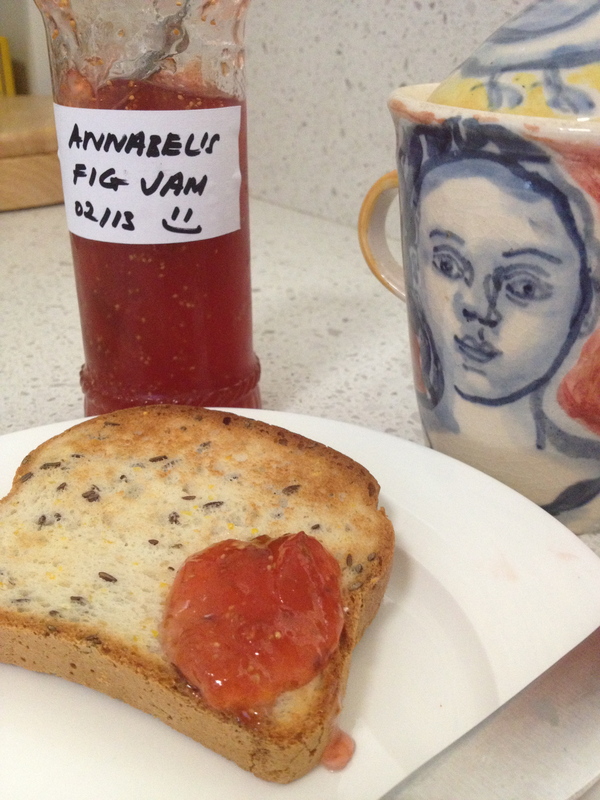 The transformation of our raw figs into jam, meant they had a new life way beyond their usual short season. With mindfulness practice, the raw moments that cause our usual suffering can be transformed and create a new life for us too. Nature reminded me of this yesterday when I was out for my daily walk. It was dusk as I walked around the bank of the Cudgegong River. The river meanders through the bottom of our farm as it heads towards town. As I rounded the curve I was met by the sunset in the western sky. The hills that cradle our valley were alight with the setting sun and the sky full of the crimson flames that meets us so often at end of our day. I observed a blaze of magnificent glory and wanted that moment to last forever. I had a camera but no shot comes near capturing the beauty. When I’m out walking these moments are common: The small black wallabies that live on the bank that are disturbed as I walk by – the rustle of the long grass, the thud, thud of their hop and then the “splash” as they scramble and swim across the river, away from the perceived danger. The wombats who come out forging at dusk or the cheeky little thrush as she guards her territory – a log in the middle of the river- they are moments I want to hang to forever. Mindfulness reminds us that moments arise, stay and pass away. Whether it is a beautiful scene, a beautiful mouthful, or a beautiful sonnet. All things observed in a moment arise, stay and pass away. Some moments are fleeting. Others like the jonquils I find seeded on the side of the road while out walking, or the wattle coming into bloom, may last longer. But they too will, in their own time, pass away. The mouthful of tiramisu, a signature dish of The Wineglass, will stay in my memory forever, although it is from a table long since cleared away. I was offered just a taste, a spoonful and I ate it in silence. There was no possibility of seconds, it was just that mouthful…in that moment. A mindful eating moment that will last in my memory forever. Imagine if each time we ate, or engaged or lived – we lived it like this? No clinging, no attachment, no desire for more. How much freer our spirits would be. The magical moments of life when there is no camera, no other way of trying to capture it. All that’s to be done is observe it, be enveloped by it. Enjoy it arise. Behold it and let it fall way. I can be truly grateful though – that I was there – not lost in my head, in some conversation past, or lost in thought about some meeting to be had in the future. That I was there, awake in that moment. Aware and alive. For this is the only moment we can be sure we’ll ever have. Moments are fleeting and they can only become memories if we’ re mindful enough to be awake to them. Awake enough to the moment to capture it- and make it a memory – for then it can truly last forever. I have a terrible admission to make. An active lifestyle is something I had to learn. It had to become a habit. Since being unwell for the past few weeks I am struggling to get back into a good routine. I have found my shadow ‘couch potato’ self is alive and well. Why is that? Habits are actions that we do so often that they become automatic. We may have to learn the action the first time. Like cleaning our teeth. Then after a few times the brain decides it no longer has to pay attention and it becomes subconscious. It’s a habit – whether you like it or not! And let’s face it, we all know habits can be either good or bad – depending of course if they help us or harm us. And regardless most habits go unnoticed – even the good ones – unnoticed until someone (like our doctor) or something (like our tight jeans) points them out! When habits no longer benefit us – or worse – habits that we still may like begin to harm us- like smoking, over eating or drinking – we might begin to think about change. And that’s when the seemingly intractable nature of habits can frustrate us each time we try to say no. New neurobiological research is showing us that changing habits is hard because the behaviours we routinely repeat become strong neural pathways in our brain. 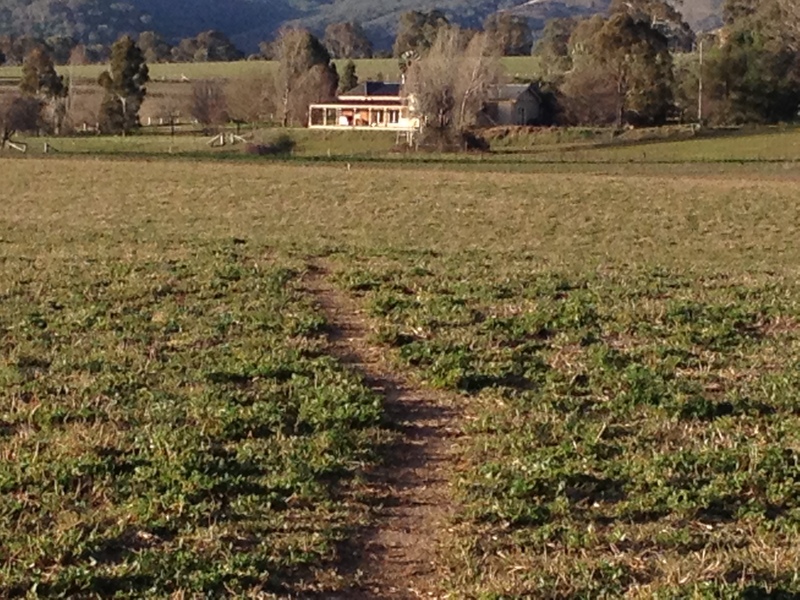 Like a path worn through the grass that is a short cut home. The neuronal pathways ‘fire’ each time we repeat the action. And if we frequently repeat the action in similar circumstance (e.g. having a cigarette with coffee or eat in response to stress) the behaviour and the circumstance link together – what ‘fires together wires together’ so the place, time or emotional states reinforce each other. Its not all bad news though because our brains can change themselves and we can work to build new habits by practicing it – again and again. And this is where mindfulness can help: Mindfulness is conscious awareness. Focusing on how we think, eat or respond to emotions is a way to see the habitual patterns we live in. And becoming aware is the first step towards change. Next formulating an intention or goal helps guide the new actions and provides motivation to keep doing it. Our intention to engage in the new behaviour is the single best predictor of doing it. So if mindfulness is part of what’s needed what is the other part? Actions! Doing it – not thinking about it – reading about it – talking about it…or writing about about it – but doing it! A new habit needs us to do it – again, again and again. 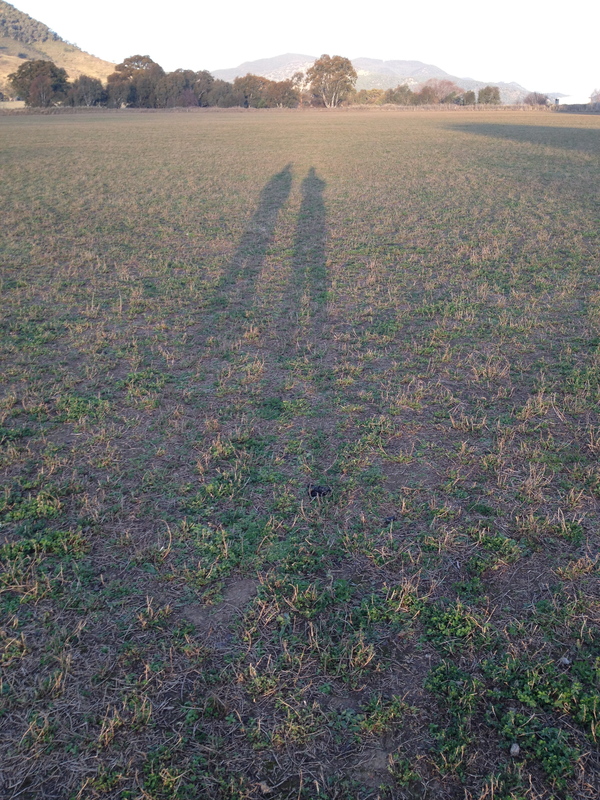 Hmm, so I guess that’s my cue – out with my shadow friend and off for a walk. Just one last thing…if you want to change a habit it helps to remember the benefits. So what are the benefits of being active? Many. For me it’s the feeling of ‘well-being’ that comes from moving the body. Also it is the love of ‘being’. The experience of spending time mindfully in nature – the touch of the breeze, the warmth of the sun, the beauty of the scene and the joy of the sounds. Ahh…there are just some habits that you hope never take on the true anatomy of a habit – unnoticed, automatic or unconscious. This is because an afternoon walk, like eating delicious food, brings such a harvest of sensory rewards that you want it to be mindful. Not just a habit – but more. A series of wonderful, mindful moments – lived again, again and again. The mornings this week have been some of the coldest of the winter. It was -2° C on Friday, and -1° C was forecast for the first day of the weekend and for our usual early Saturday morning bike ride with friends. Good sense meant a later start, and out of the cold and frosty morning emerged one of the glorious sunny, and nearly cloudless blue sky days the Central West is well known for. Cycling is popular in our town. However riding in a group means everyone has preferences for how they like to ride; some like to go fast and get to the top of the hill first, others prefer to put their heads down and burn energy to the ‘max’, while many of us prefer to stay together and chat about the week’s past events. 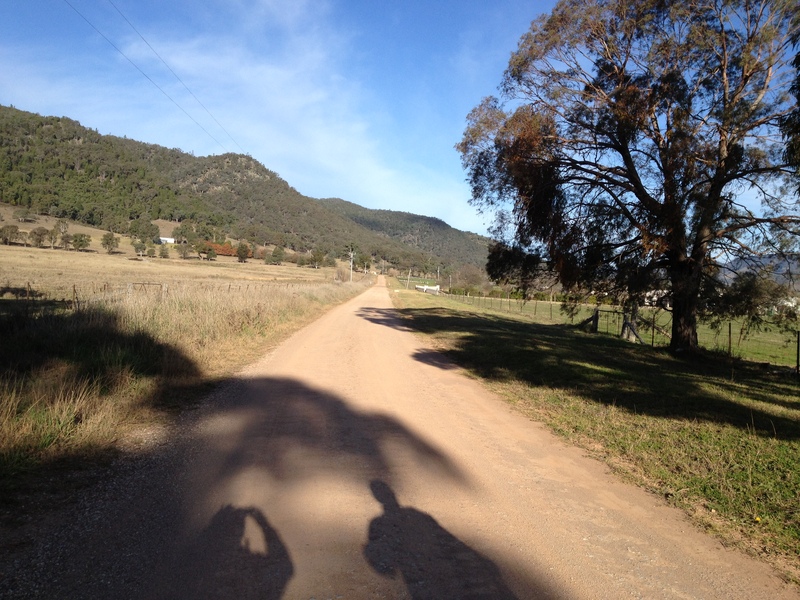 Sometime I choose to ride out mindfully – which means I am by myself and mostly last. But the rewards are plentiful – the majesty of the hills, the visual array of the farms, the sounds of the animals, the momentary whiff of a fragrant garden and the personality of the different vineyards we pass. Time spent mindfully rarely disappoints. This weekend out of the cold and frosts of winter emerged the first daffodils of the season. I love Daffodils. A sign of spring. A sign of a new beginning. No matter where we cycle, the end destination is always the same. The Quaff Café is a place described by the upholder of good food as a quirky, quiet backstreet cottage that has a quaint courtyard up the back. 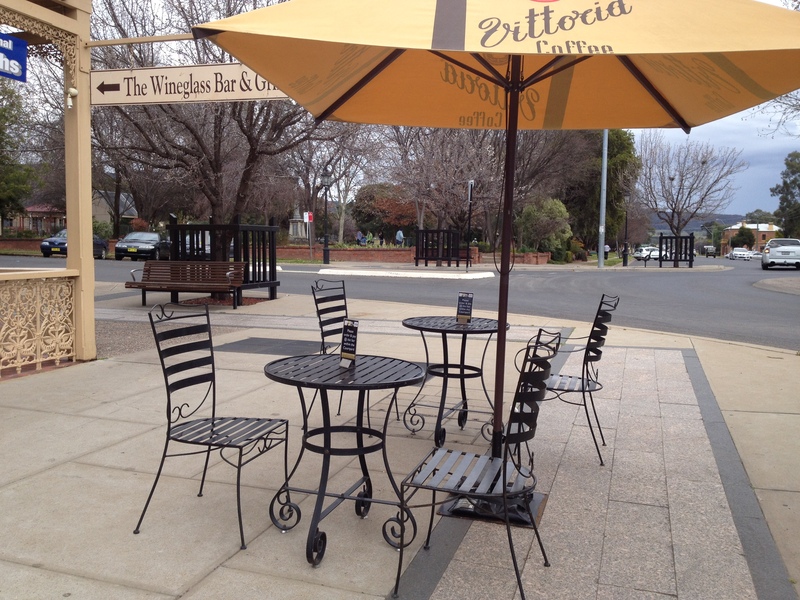 Again everyone in the peloton has preferences – some do fruit toast, some do a hot breakfast and we all do coffee. The problem of eating with a group is that the sight of enticing food on the menu, or on other’s plates , can make us want to eat, even if we’re not hungry and have eaten before leaving home. The unhelpful thoughts inevitably arise (“I want to eat this..” ). The narrative builds (“I have done plenty of exercise surely I deserve a treat”). You probably know how it goes…on and on, until the thoughts take over and we end up mindlessly eating too much, or not eating want we want. All of which can leave us feeling guilty or cross. Psychologists call this the abstinence violation effect (a sense of loss of control over our behaviour that has a demoralising effect). In mindfulness practice this is called life. Mindfulness helps us learn to accept and tolerate the urges and cravings that invariably arise when we are surrounded by eating cues such as freshly baked scones! Triggers for “…eating because it’s there”, “eating because it’s nice”, “eating because I’m too busy talking” or “eating because I just don’t have time to think before the waitress comes ” and “eating because it’s in my mouth before I even notice what I’m eating”. Eating mindfully is easy in theory – in reality in an environment filled with readily available food it’s hard. Very hard. And it’s hardest of all when surrounded by friends, with our attention swirling around in the joys, and conversations, and social pressures of being with others. What to do? I think we are all in situations when we could ask what ourselves what can we do? By breathing we give ourselves the moment: to respond, not react. Breathing helps bring us out of our heads and getting swayed by our thoughts (I notice the thought: “Hmm… my partner’s ordering scones perhaps I should order something too?”). Focusing on the physical sensations of our breath helps bring our attention back into our body. It’s the reminder to turn inward: Am I hungry? How hungry am I? Am I thirsty? Am I emotional? What does my body need right now? Each moment our breath is an opportunity for a new beginning. Even once we have made the decision what to eat (or what not to eat), when we’re eating with friends, it can remain hard to stay mindful. If we’re drawn into our friends compelling stories (“… and then she said to me… “). Breathe. When we’re back in our heads and lost in our thoughts (“…humff… that looks nice why did I just order coffee…”). Breathe. 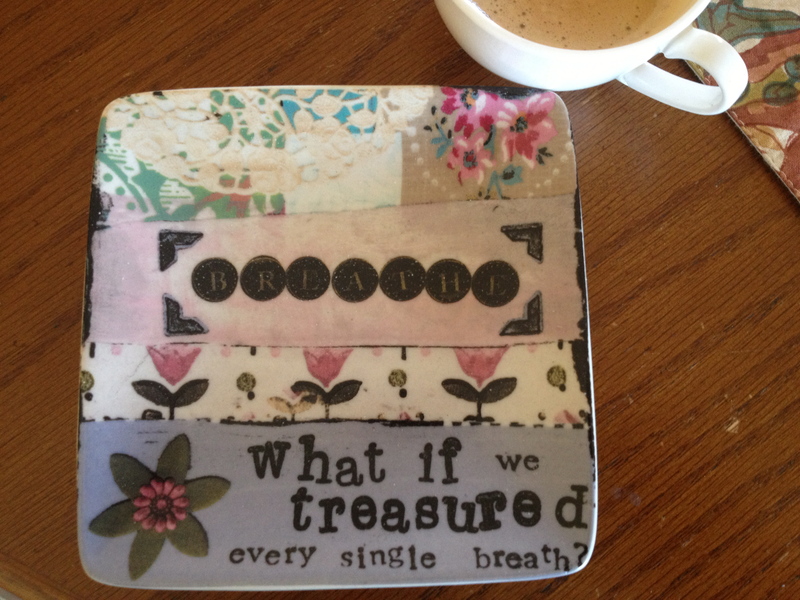 A breath is an invitation back to the mouthful, back to the body, back to the intention to eat or drink this mindfully. Each breath is an invitation back. Back to this life, lived in this one and only moment. And yes, then I’m reminded again about the pleasure of eating mindfully. Half a scone on the neighbouring plate is pushed towards me. Still warm, it’s topped with homemade raspberry jam. I add a dollop of cream. One, two, three slow and delicious mouthfuls. I smile and reflect and I’m thankful – for his mindfulness, and yes how well and truly he knows me…. Mindful eating invites us to consider more than how our food tastes. It’s also about taking the time to consider where, when and how our food comes to arrive at our door. And what better place to learn these lessons, than at the many local famers markets that now bless so many of our lives. 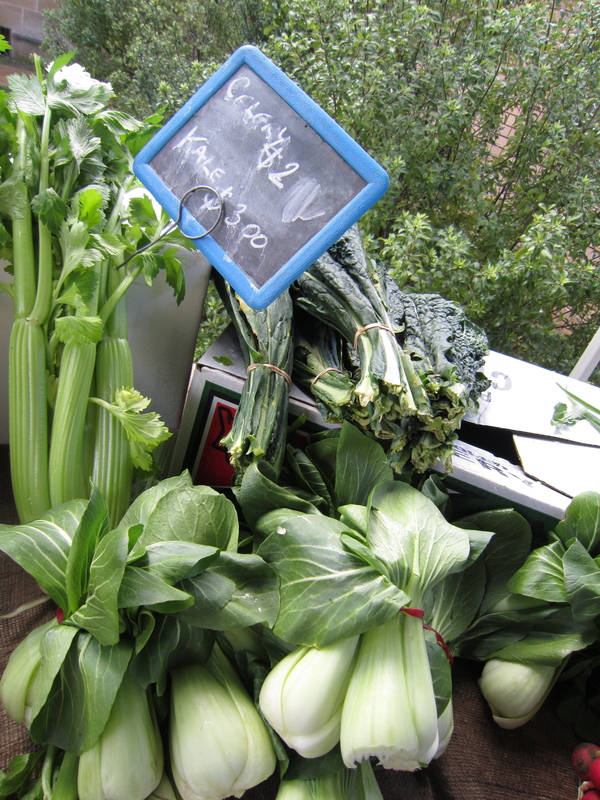 This morning our local Farmer’s Market was showered with rain, insistent winds and 13˚C temperatures. Yet the loyal farmers and the familiar faces of local producers still arrived. With their vibrant produce catching our attention, its so easy to remember to stop, ask and listen to their stories of what’s in season, how it’s grown and where it comes from. Apples crisped by the cold mornings of our Central West neighbours in Bathurst. Oranges fragrant, plump and juicy from the water blessed Narromine. It is is predicted to be the coldest weekend of the year for us here in the Central West so we retreat home. Inside we unpack the bounty of the morning’s harvest with its promise of vital, delicious and nourishing meals for the coming week. 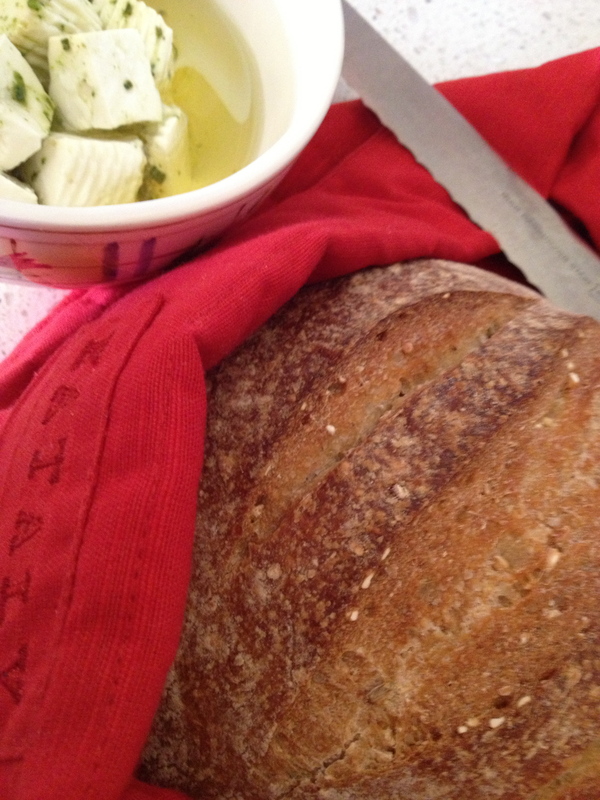 At last, sharing our simple local fare by the log fire- goat fetta with pesto and freshly baked sourdough. Completed by the addition of a glass of regional red wine. But first, a mindful moment to remember our gratitude for the land and the food it produced. And for those who tended and nourished it, so it could tend and nourish us. There are few things that are so simple, yet so full of pleasure as picking something from the garden, cooking it and serving it to yourself, family or friends. 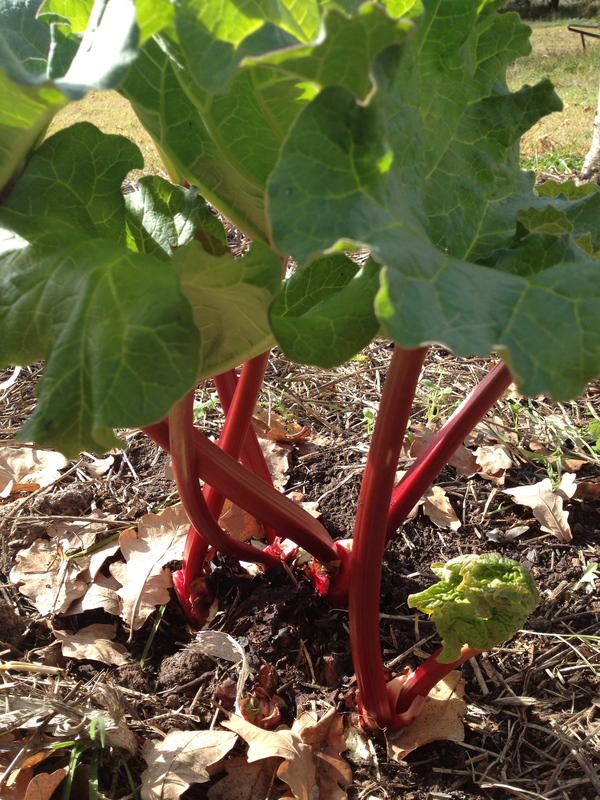 Rhubarb is easy to grow and has become a staple in our garden, but you can also have fun buying it from your local farmers market. 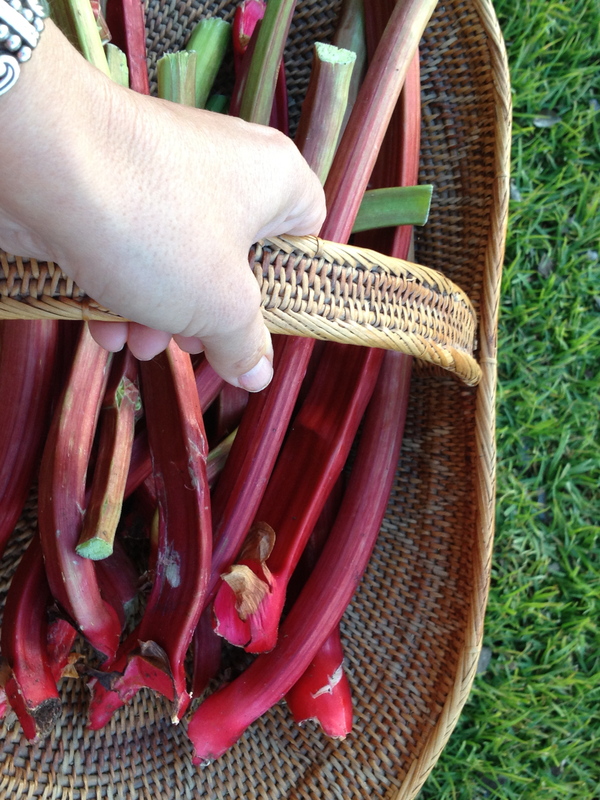 Rhubarb is a nutrition treasure too. It’s naturally very low in carbohydrate, so if it’s poached with a little thought, it can offer a light fruit dessert and be ‘everyday’ fare. 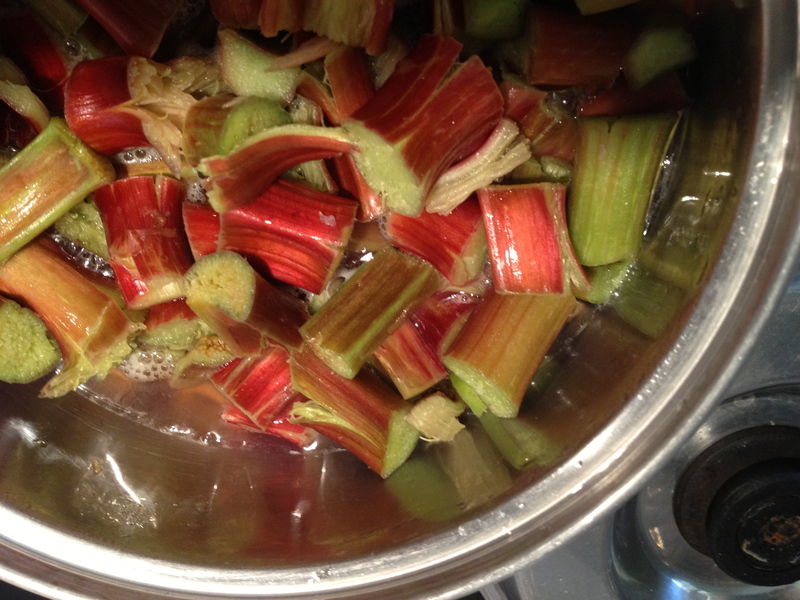 With rhubarb something is needed for flavour and sweetness – I grate in lemon rind or fresh ginger. 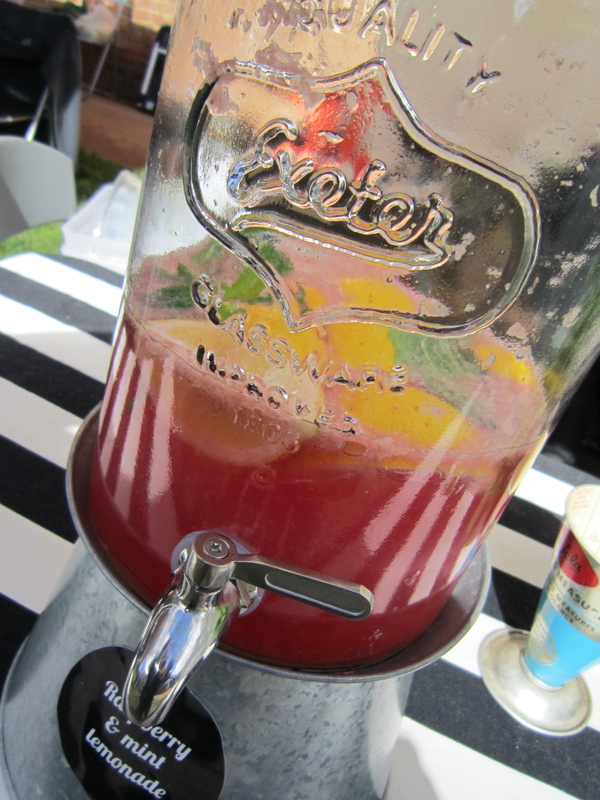 Sugar can be added to taste or use any sweetening alternative that you prefer. Someone once even suggested poaching it in ‘diet’ ginger beer – I haven’t tried it – but it highlights this point – growing and cooking your own food means you get to choose the gardening products and the ingredients that are added to the foods that you eat. Today our rhubarb dish is a little different. We have a daughter returning home for a holiday break so it’s a special occasion. Sharing a meal again around the table is made a little more special by including a treat. 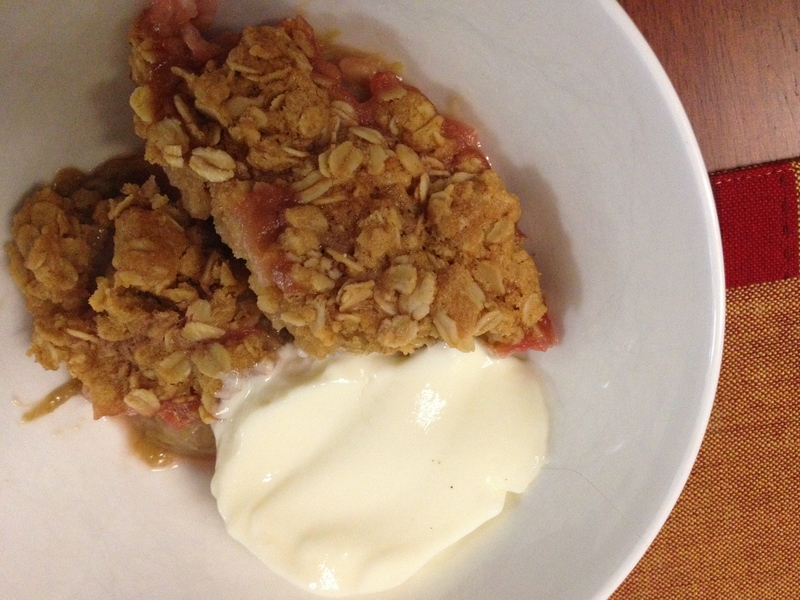 I pull out the family favorite recipes and top the lightly poached rhubarb with Mum’s ‘Oat Crumble’. A delicious oaty mix, with brown sugar that caramelizes into a tantalising topping that can adorn any fruit; stewed rhubarb, apple or apricot are all yummy. Eating mindfully means I can make less and enjoy it more, so unlike days past with enormous serving dishes that tempt ‘seconds’ or over large portions, I split the dessert and make two. One for this meal and the other to send home for loved ones elsewhere. Finally, time to eat ! We serve it with vanilla yoghurt. It’s wonderful how eating mindfully makes it easier to dwell in the sensual pleasures of a dessert like fresh rhubarb crumble. When we are fully awake in the moment of eating, we are not letting our thoughts entertain the idea of racing through this serve so we can have another, or that ‘someone else’ is eating more than their fair share – we can just stay here, now, fully in the moment. A treat, when thoughtfully planned out and enjoyed, mouthful by mindful mouthful, leaves no time for feeling guilty – not before -or after – or ever – the only need is to sit replete in its joyful memory, tasting the last of the flavours as they linger, knowing this is just how all things delicious should be consumed. 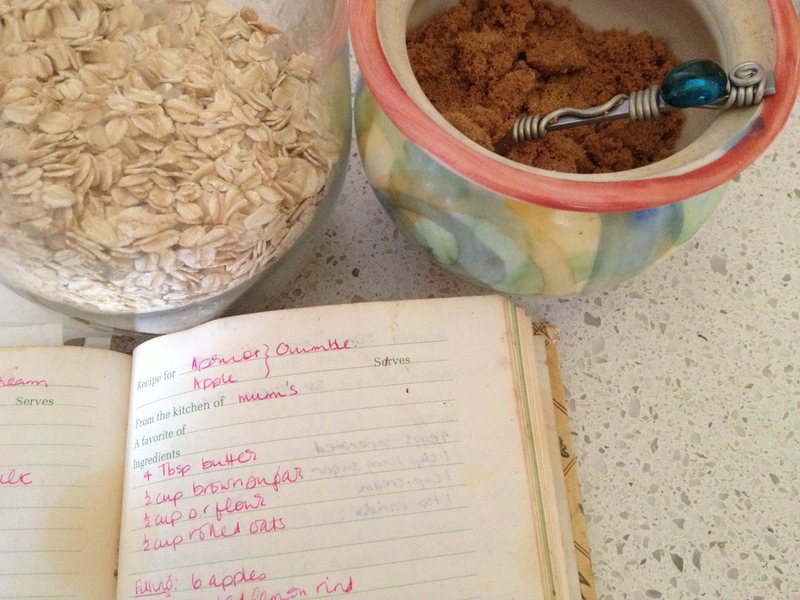 Method: Rub the butter into the flour until it resembles breadcrumbs, then add in sugar and oats and mix through. Top stewed fruit and bake for 30 minutes at 180 degrees Celsius. Pause. Take a breath. Focus. It’s so simple. Yet why do we forget this small, first step towards mindful eating? It’s easy to forget to eat mindfully anytime, but at breakfast it’s more likely than most. Hurried. Routine. Same food often, day after day. Another workday and another meal with our minds more occupied by the “to-do list” than the food before us. 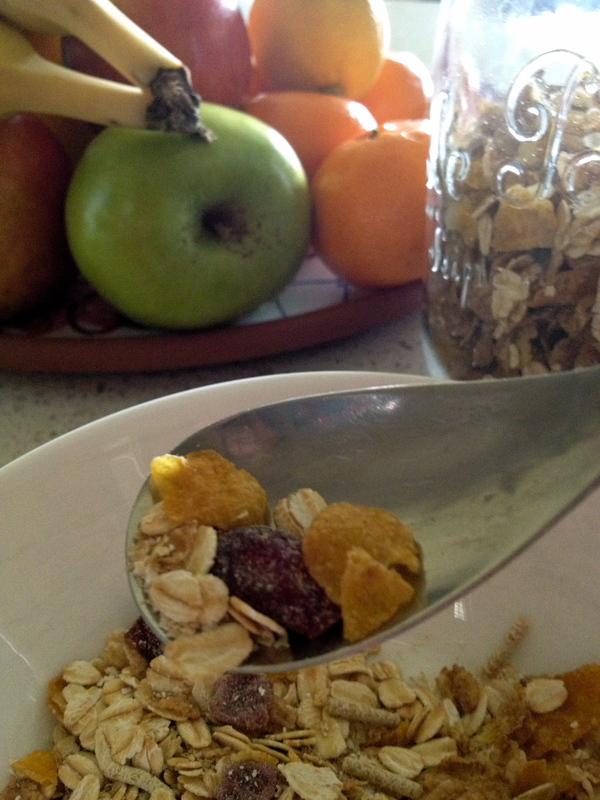 I was reminded to ‘pause’ at breakfast today by a wise teacher. The pause reminded me that breakfast is often the meal I enjoy most. Oats. Dried fruit. Yoghurt. Not much extra time was needed to taste, explore and fully experience it. 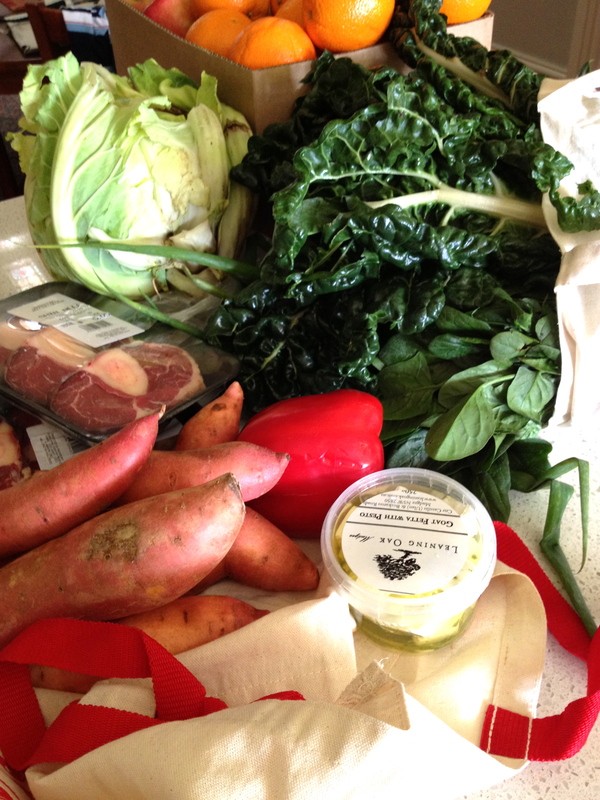 A gratitude for the farmers and those who helped it arrive at my door. This moment. This food and it’s nutrition, nourishing and becoming me. Pause half way through the meal. Pause at the end of the meal. Pause when you notice you are distracted or eating out of habit. Pause. Take a breath. And focus on the food before you. It is such a simple way to bless yourself.